Not all fencing belongs outdoors. 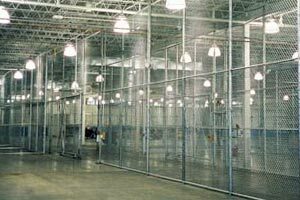 A variety of facilities find that economical chain link fabric fencing materials are ideal for partitioning off interior spaces, providing secure enclosures, and other uses, especially for large interior spaces like warehouses and storage facilities. Our Minnesota fence installation and supplies company can help you create secure, indoor fencing solutions that solve tough problems effectively at affordable prices. 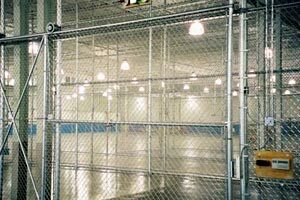 Our modular, pre-framed chain link panels, gates, and doorways let you create or change interior partitions and enclosures quickly. Or create any design from individual components. We have selected the leading manufacturers as our suppliers to ensure quality, reliability and durability. High demand by individuals and businesses for storage spaces has led to the creation of more and more public storage facilities throughout the Twin Cities Metro area, with many being created in existing warehouse-type buildings. 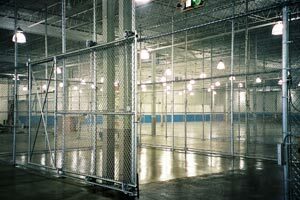 As an alternative to solid walls and rollup metal doors for individual spaces, chain link partitions and gates are popular, cost-cutting, secure options. 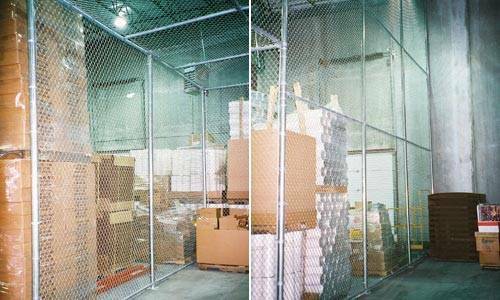 Our Minneapolis fence and security products company supplies all chain link frame components, gates and woven, galvanized mesh fabric as well as efficient, affordable installation of custom interior storage enclosure systems. 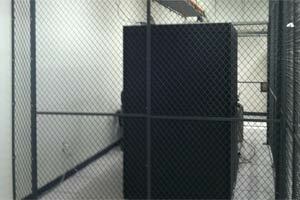 Increasingly, computer data center security is being enhanced by installing interior partitions that prevent unauthorized entry. 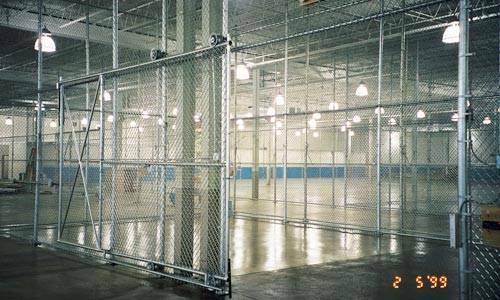 Chain link partitions offer several advantages over costly engineered metal partitions. Better visibility, increased air flow, and unmatched entry deterrence combine with much lower additional cost to make this material a top choice. 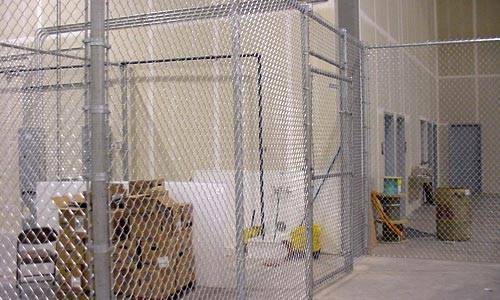 As the most trusted fencing and security products contractor in the Minneapolis St. Paul metro area, we want you to have the facts about data center security enclosure systems. Throughout the Minneapolis St. Paul area, companies and organizations operate in large warehouse-like spaces. 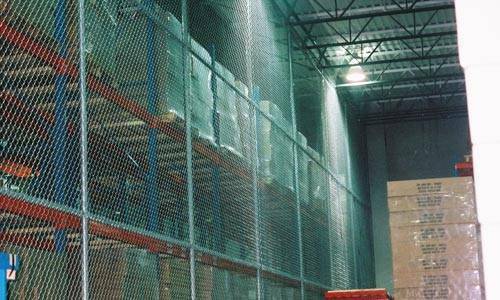 From manufacturers and wholesalers to public storage facilities, distribution centers and more, safeguarding valuable products and materials is a high priority. 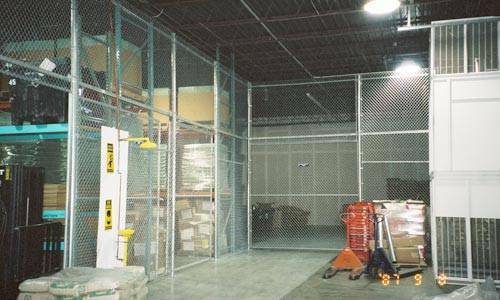 Creating secure areas for specific needs is often the best solution. 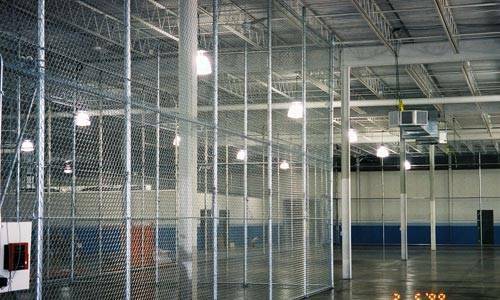 Chain link fencing materials are an ideal, low-cost way to create indoor enclosures to prevent theft. As the Twin Cities most experienced fence supply and installation company, we’re ready to help our commercial and industrial customers meet their requirements and budget. Safety is a major concern for all companies and organizations. 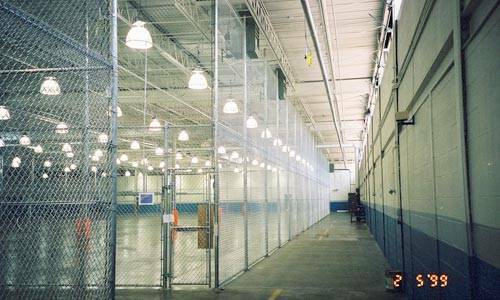 Indoor operations have their own safety issues, especially in large open spaces. 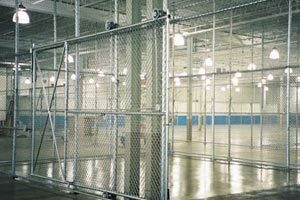 For risk prevention from industrial machinery and pedestrian and vehicle traffic to hazardous materials and even animal control, chain link enclosures and cages offer affordable solutions for many safety concerns. Strong, and offering excellent visibility, this material is an excellent choice for protecting people from a wide range of hazards. 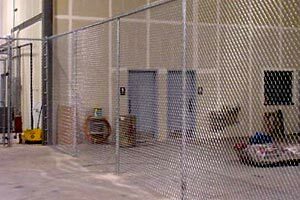 At our fence company in Minneapolis, we supply and install indoor chain link safety features at highly competitive pricing. 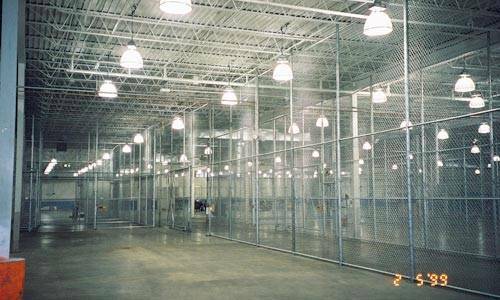 Businesses, government agencies and other organizations often need to create specific areas in large, open indoor spaces that restrict entry to only authorized personnel. Solid wall construction for such spaces is costly and restricts light and air circulation. 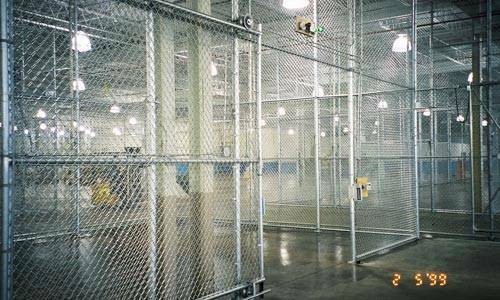 Chain link enclosures, using open woven metal fabric installed over tubular metal framing, offer excellent security at much lower cost. Flexible in design, they cut lighting and ventilation costs. 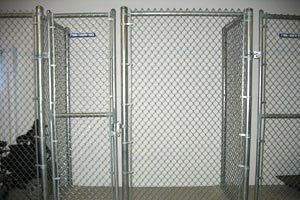 As the Twin Cities leading fencing and security products supplier and installation contractor, we’re your best choice for these interior security enclosures. 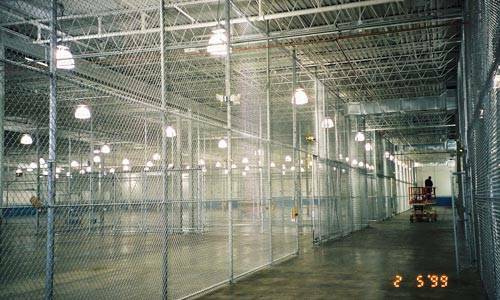 Creating secure, well ventilated interior enclosures and partitions with commercial-grade chain link fence materials is a proven way to enhance your warehousing, distribution center, or other expansive building spaces at affordable cost. 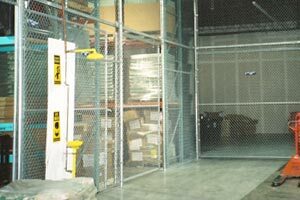 Sliding chain link gates, equipped with automatic openers and closers, are the most efficient way to provide fast access. Count on our top-rated fence supply and installation company to supply materials for your DIY project or to install a complete interior enclosure or cage for you. Our competitive price quotes ensure you of maximum value. For pet boarding facilities, animal control and rescue centers, veterinary clinics and agricultural enterprises, indoor housing of animals of all sizes is a common need in Minnesota. 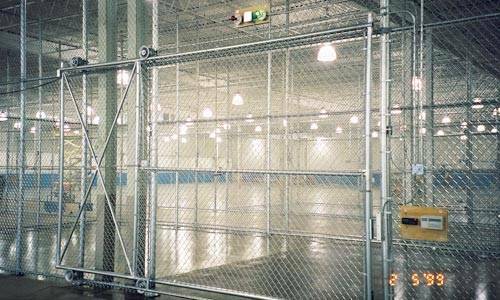 Chain link fencing materials and customized doors and gates are ideal for these uses. Offering durability, fast installation, low cost, easy cleaning and sanitizing, it’s the material of choice. Since 1983, we have supplied materials for and installed animal housing systems for customers throughout the Twin Cities metro area. Our affordable pricing and expert installation has earned us an unmatched reputation. 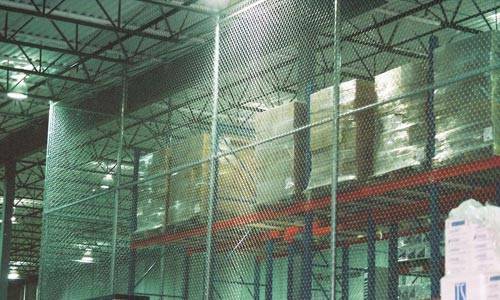 Warehouses – Create partitioned areas to separate classes of products, or complete enclosures for security reasons. 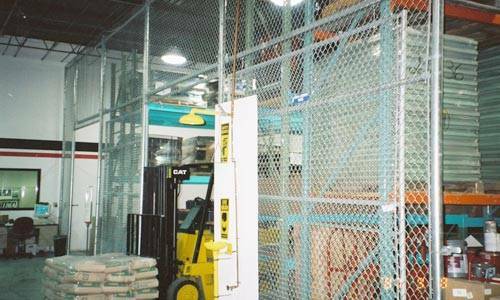 Chain link partitions provide complete visibility, while safeguarding property and inventory. Gates allow access by forklifts, and can include automatic operators. 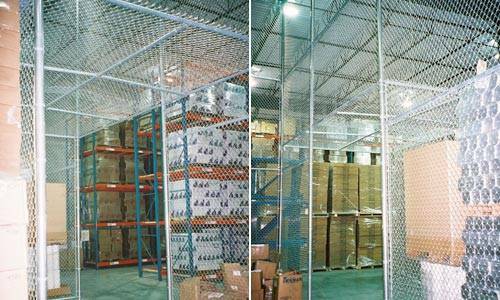 Storage Facilities – Create enclosed areas to define customer storage and to provide security for property. 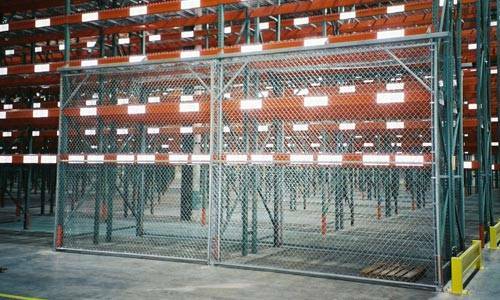 In monitored storage facilities, personnel or CCTV cameras can view all areas while your property remains protected. Factories and Industrial Facilities – Tool cribs, parts storage, assembly area partitions, and even office areas and break areas are easily created, and can be altered or re-designed easily. Easy visibility, air circulation, and lighting are additional benefits. Gymnasiums and Recreation Centers – Equipment storage rooms, towel rooms, and other enclosed areas can be created quickly, and provide security, while maintaining visibility, air circulation, and lighting. 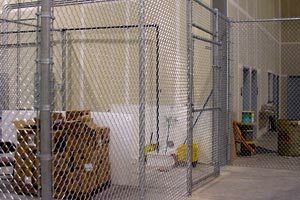 Animal Control and Veterinary Facilities – Kennels, enclosures, and stalls are common uses in these facilities. Personnel have complete visibility of dogs, cats, horses and other animals, and the enclosures and kennels are easy to clean and maintain in sanitary condition. 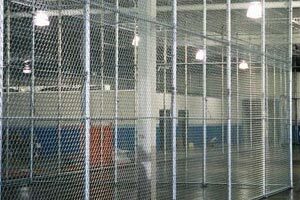 Temporary Inmate Facilities – Secure enclosures for incarceration can be created quickly for temporary needs of law enforcement agencies during protests or other civil disturbances. With our volume-purchasing arrangements, we get discounts from our chain link fencing suppliers and we pass our savings to our customers. We offer highly competitive pricing, along with our extensive experience, durable products and unmatched customer service. Our sales staff is ready to meet with you to discuss what product best fits your requirements. We offer free no-obligation price estimates that are accurate, with no hidden costs. 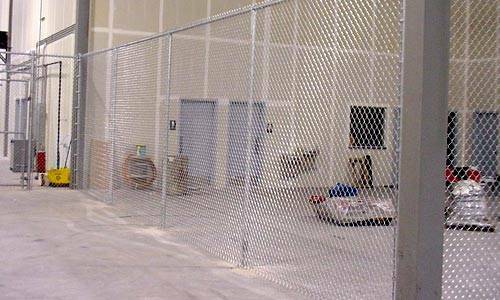 Inside or out, our Minnesota fence company has the solutions for every commercial indoor chain link fencing need. When your needs include dividing or enclosing areas indoors, we have the modular solutions you need readily available, or can supply and install all the components for a custom-designed solution for interior partitions, enclosures, and cages. Bring us your plans and requirements, and we’ll find great solutions for them. As the leading fencing contractor in the Minneapolis and St. Paul metro area, we invite you to contact us to discuss your ideas. Our experienced consultants will help you turn your interior fencing needs into reality efficiently and economically.